The Chinese cancer intervention market is large, rapidly growing, and dominated by drug and equipment suppliers from outside of China. These are all important considerations for pharmaceutical companies in North America, Europe, and other developed regions that are seeking strong growth and high profits, reports BCC Research in a recent study, The Chinese Market for Cancer Intervention. China’s quickly expanding cancer intervention market is due to the large number of cancer cases that are confirmed there each year. BCC Research estimates that in 2015, 4.325 million cases of cancers were diagnosed in China. The most common cancer types in China include lung, gastric, liver, esophageal, colorectal, and breast cancers. These six types accounted for nearly 70% of all cancers diagnosed in China in 2015. The number of patients with cancer who survive has been increasing in recent years as a result of improving cancer treatment methods. At the same time, Chinese companies’ research and development of antitumor drugs, immunomodulators, and radiotherapy equipment still falls far behind that of their foreign counterparts. As a result, big international pharmaceutical companies and medical equipment manufacturers have immense opportunities in the Chinese market. Since 2005, Pfizer, Novartis, Roche, Sanofi, Merck Sharp & Dohme, and other companies have established research and development centers in China not only for drug development, but also to facilitate partnerships with Chinese academic institutions and organizations, to train physicians, and to hold academic and promotional events. Meanwhile, most Chinese companies continue to develop generic drugs and inexpensive versions of medical equipment that was first developed by their foreign counterparts. 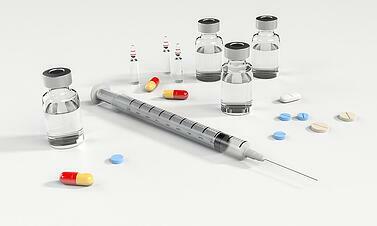 Chinese companies have made some progress in developing reference listed drugs and advanced medical equipment. For example, elemene injection, an antitumor drug derived from a traditional Chinese medicine, was first developed by China-based Dalian Holley Kingkong Pharmaceutical. 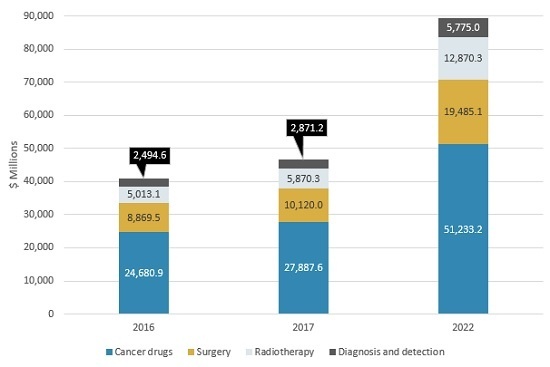 BCC Research predicts that the Chinese market for cancer intervention will top $89.3 billion in 2022, up from an estimated $46.7 billion in 2017. DNA sequencing for cancer screening, early detection, diagnosis, therapy guidance, and monitoring will have strong growth, especially for lung cancer, colorectal cancer, breast cancer, and leukemia/lymphoma. Paclitaxel will continue to dominate the antitumor market, reaching $2.7 billion in sales by 2022 with a 13.2% compound annual growth rate. Roche has the largest share of the Chinese cancer intervention market, with end-user sales of more than $2.5 billion in 2016 for drugs used for cancer treatment. Last week, Bloomberg reported that Zai Lab, a Chinese drug developer working on cancer treatments, chose banks to arrange a planned US initial public offering that could raise approximately $150 million. Its sources are named only as people with knowledge of the matter who asked not to be identified because the information is private. The Shanghai-based biopharmaceutical company, started by former Pfizer scientist Samantha Du in 2014, is working with Citigroup and JPMorgan Chase & Co. It is targeting a market capitalization of approximately $1 billion. Zai Lab plans to start taking investor orders as soon as September. China’s pharmaceutical market has been given a boost by entrepreneurs like Du, known as “sea turtles,” who have returned to the country after working or studying overseas. Zai Lab has established its own early-stage drug discovery team focused on immuno-oncology. The company has also licensed experimental medicines from big pharmaceutical companies to populate its immediate pipeline, including a potential treatment for lung cancer from Sanofi and a liver drug candidate from Bristol-Myers Squibb. First-time share sales from Chinese healthcare companies have raised $6.2 billion in the past 12 months, data compiled by Bloomberg show. BeiGene, a Chinese developer of immuno-oncology drugs, has more than tripled since it began trading in the United States last year and announced last week that it plans to raise $125 million in a follow-on share sale. BGI Genomics, a unit of the world’s biggest DNA-sequencing group, has surged more than seven-fold since its Shenzhen debut last month. Also last week, China Money Network reported that Chinese venture capital firm Qiming Venture Partners led a $20 million financing round in New Horizon Health, a Chinese precision health startup. Chinese investment firms Legend Capital, SoftBank China, and other unnamed investors also participated in the round. The capital raised will be used to finance New Horizon Health’s research and development of early-stage cancer screening products, with a focus on gastrointestinal cancer. New Horizon Health will also strive to establish big data and artificial intelligence capabilities to aid its development of next-generation cancer screening technology, according to a company announcement. Founded in 2015, New Horizon Health has completed development of its first product for early screening of colorectal cancer based on FIT-DNA technology, which detects altered DNA in the stool. The product allows users to test samples at home to look for signs of colon cancer. This technique could allow patients to detect precancerous lesions five years earlier than regular blood tests and therefore improve the chance of full recovery via simple colonoscopy. Based on similar technology, New Horizon Health launched new gastric cancer detection technology and combined gastrointestinal cancer detection products earlier this year.